The Understanding the Threat team hit the ground running in San Diego last Wednesday (February 21st) launching salvos against the Muslim Brotherhood (MB) and Hamas – an inherent part of the MB – and opening the eyes of many leaders, police, prosecutors and citizens about the threat of the Islamic Movement to the San Diego community. As detailed in last Tuesday’s article here, UTT’s President was met with protests from the terrorist group Hamas doing business as the Council on American Islamic Relations (CAIR) and their stooges in the media- Fox News 5, the local ABC affiliate, as well as the San Diego Tribune – when he spoke to the U.S. Naval Academy Alumni Association Wednesday. In addition to Hamas leader Hanif Mohebi, Director of Hamas/CAIR San Diego, trying to get into the meeting room, the Imam of the Muslim Brotherhood’s Islamic Center of San Diego, Imam Sheikh Taha Hassane, made a fool of himself by screaming and trying to defend himself and his jihadi mosque after the entire audience saw the evidence the Muslim Brotherhood (North American Islamic Trust – NAIT) owns the mosque’s property. Thursday, the UTT team met with local leaders to discuss issues in the community related to the jihadi threat, and Thursday night the team presented at the Jewish Community Center. The UTT team was energized by a group of sharp and courageous leaders from the Jewish community unafraid to speak truth about the Islamic threat. 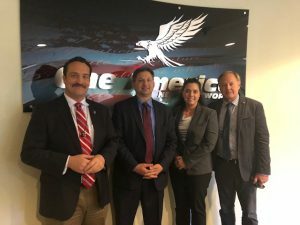 Friday, the UTT team met with more leaders in the San Diego community before an appearance on Tipping Point with Liz Wheeler on One America News Network (OANN). Friday night the team spoke to hundreds of people at Skyline Church. It was a powerful event with the team not only sharing about the local threat from jihadis and jihadi organizations, but with Stephanie Ameiss sharing her story of her 60 foot fall from a bridge as a police cadet, her amazing journey in recovery, her dedicated effort to finally become a police officer, and her call to speak truth about the Islamic threat. Saturday, UTT’s team gave a 4 hour presentation to and trained a group of Patriot’s at the Ramona Tea Party. Throughout all of this, the team brought their powerful and unique perspective on this war to individuals and audiences which is truly – as one prosecutor puts it – an “unimpeachable” detailing of the Islamic threat to local communities. John Guandolo came to an understanding of the jihadi threat and sharia, and how broken the federal response is by investigating the jihadis, specifically the Muslim Brotherhood, as an FBI agent. Chris Gaubatz came to understand the Muslim Brotherhood/Hamas and their reliance on sharia by working undercover inside Hamas in the U.S. (CAIR). Stephanie Ameiss was a trained Terrorism Liaison Officer (TLO), and came to understand the threat by attending courses provided by UTT, where she realized neither she nor other TLO’s had the true information about the threat to actually target and go after real jihadis, until she experienced the UTT program. Billy and Karen Vaughn came to understand the Islamic threat and the ignorance and incompetence of U.S. military leaders with regards to the threat, by experiencing the death of their son Aaron Carson Vaughn (SEAL Team Six) in combat in Afghanistan, and all that transpired after it. 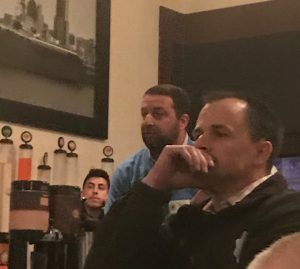 In sharing their stories, the Understanding the Threat team presented the truth about the Muslim Brotherhood’s Movement and the larger Islamic Movement, how significantly it has penetrated our system, how uninformed/treasonous our leadership is, and that the path to victory is at the local level. Understanding the Threat took the fight to the enemy in San Diego, spoke truth to local leaders and citizens, and is providing a framework for the people of San Diego to crush the enemy. Good, good news that you reached so many. God bless your work. It appears to me thst our National Defense has been severely compromised by allowing Muslims entry to our military branches of service. Not only that, but the truth about Islam is not being addressed by our federal, state, or even local law enforcement agencies for the sake of not offending a religion? I for one am in favor of an anti-Islam militia nation wide connected with its on intranet capabilities and totally void of social media. We are losing this war of migrant invasion. If we do nothing then we will be subdued and exterminated by the Benedict Arnold’s that have contaminated Congress. Both parties are complicit in the endeavor to destroy America. Great work, John and kudos to your team. This is the way to go. Blitz a town or city, cover all the sympathetic bases, make waves, and leave the populace educated. Then the work you do goes deep into the mainstream. Thanks so much for what you do. You all are making a difference. Well done guys. Keep up the good fight. God bless.